In a discussion with fellow free market bloggers here in Manila, I argued that a patent (or any other type of intellectual property right (IPR)) applies only to one molecule or product and that it is possible to have hundreds of patents, say, to cure a particular disease like blindness. See my longer argument here, IPR and medicines, part 6. This is wrong logic. There are hundreds, if not thousands of molecules and molecular compounds, that can be invented from rubber. That is why there are dozens of different tires from Michelin alone, from Goodyear, from Bridgestone, Continental, Dunlop, Firestone, Kumho, Pirelli, Toyo, Yokohama, etc. Each tire manufacturer would have a phalanx of different tires suited for different types of roads: ordinary roads, race track, rugged terrain, snow, mud, sand and desert, and so on. Not one of those many tire manufacturers make tires from wood or leather. There is also one concern that two or more inventors can work independently on something, but only one of them will be rewarded with a patent on a first come, first served basis. Although this might be theoretically possible, I do not know if this ever happened. Let me expand on the search for new drugs to kill different diseases, say prostate cancer. Photo credit here and the next picture from Mens Hormonal Health. I often cite prostate cancer for the simple reason that it's the disease that killed my elder brother about 4 years ago, also my mother's cousin just 2 years ago. 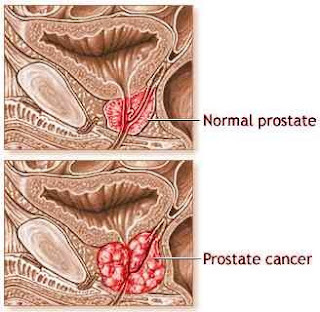 And just this afternoon, I talked to a friend here in Manila, said she's working 7 days non-stop to earn more to help her father who has prostate cancer, stage 4. If I write blog articles like this, I did not hire molecular biologists or biochemists or zoologists or botanists or other natural scientists. I also did not construct a laboratory and will not require dozens of animals, then people, sick and non-sick, for different types of clinal trials. Thus, if other people will confiscate my blog articles and say that they are the ones who really wrote such papers, then no problem with me if they can steal and claim authorship of 1, 2, or a dozen article from this blog. There was little cost on my part to write each blog article. But can the same comparison apply to the inventors and developers of those weird-sounding drug molecules? And those inventors are not even sure if after hurdling 10 years of continued research on each molecule, it will become successful and hurdle the 2nd to the last and the last clinal trials. Meanwhile the clock is ticking. Their 20 years patent on the molecule has only 10 or 8 or 6 years to go and they have not marketed and sold the drug yet. 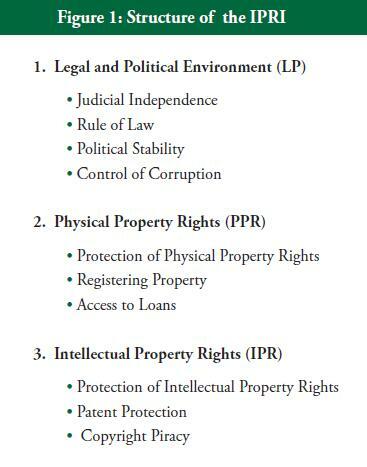 Let each IP owner or holder decide whether they want their IP invention (a song, a poem, a blog article, a book, etc.) be shared for all, zero IPR, or be made exclusive for them, even for a few months or years. A call to "abolish all IPR" is coercion by itself, when free marketers are supposed to be fighting coercion in the first place. As to whether it should be the government or some private entity that should grant an IPR, I have discussed it earlier in IPR and medicines, part 7. There are several indicators that a group is insecure and unsure of its position, or deep inside it may already recognize that its position is wrong but it has already started lying, and they must continue the lie. One is cowardice to public debates when frontally and explicitly being challenged. Two is censorship, disallowing contrary comments and make it appear that no one is challenging them anyway. Then I copied it on print-screen as proof as I suspect that WWF will remain allergic to contrary comments and will remain a coward to public debates. It's now Wednesday or 4 days after I posted in their comments section. Did they approve the comment? No way. Two otner comments that said "Halleluiah to EH" were posted but my comment is still "awaiting moderation." Yeah, right. Only "pat my back" comments allowed, critical comments are disallowed. WWF and EH guys, yuhooo! Great job at censorship. Now let's go back to hard data and facts about climate. 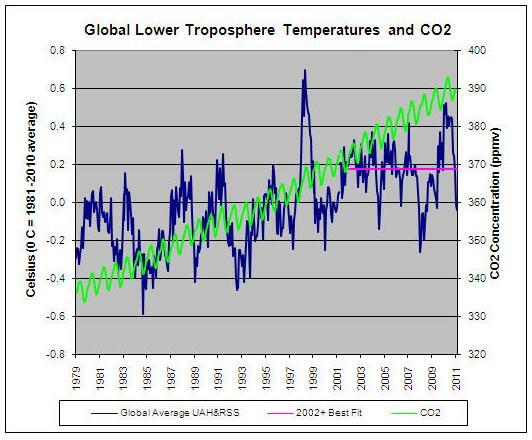 Is the Earth really on "unprecedented warming"? No precedents of warm period in the past, only recent warming and climate change due to humanity's modernization and continued use of non-renewable energy, continued high use of electricity? This is the graph of sea surface temperature (SST) anomaly as of March 27, 2011, in Nino region 3.4, the biggest area of equatorial Pacific Ocean. Data is from Australia's Bureau of Meteorology. The temperature anomaly (or deviation from average temperature) has increased a bit from its low of about -1.6 C sometime in early January this year, to about -0.6 C as of last weekend. 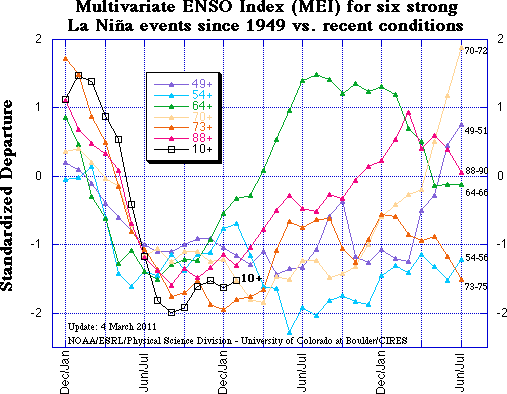 Still in the negative and La Nina territory. 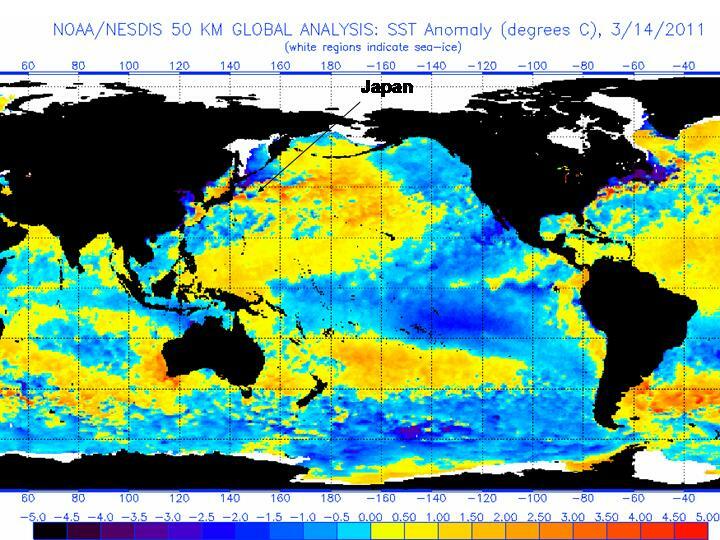 Terrible "man-made global warming", sustained cooling of the planet's sea surface, equatorial Pacific, for many months now. So at the time that the Philippines was making a record of having the biggest number of fooled-by-WWF EH of "catastrophic man-made warming", the Philippines and nearby countries in East Asia were enjoying colder than normal ocean and air. Take note also the cloudy sky everyday in Metro Manila and many other places in the Philippines, even in late March. And more recent data here to show that "unprecedented warming" and catastrophic "man-made climate change" is 100 percent lie. 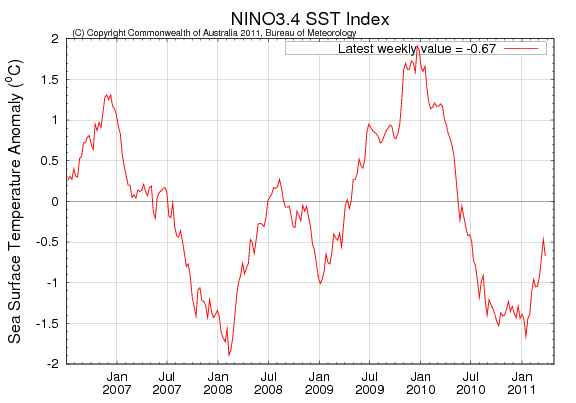 Here is a graph of warming-cooling-warming-cooling cycle of Nino 3.4 region in a short period from 2000 to 2011. Cooling in 2000-01, warming in 2002-05, cooling in 2006, warming in 2007, cooling in 2008-mid 2009, warming from mid-2009 to mid-2010, cooling from there up to now. Data is from NCDC/NOAA, incorporated in WUWT's ENSO Page. "Unprecedented warming" -- anyone, please say that again? And here is the longer story of warming-cooling-warming-cooling cycle of Pacific Ocean from 1950 to 2011. Data is from NCDC/NOAA., also incorporated in the above WUWT's ENSO page. For those wondering why all the planet's major climate and oceanography research centers are focusing on measuring temperature changes and anomaly in equatorial Pacific, well Pacific Ocean is the biggest of all bodies of water in the planet, covering about 30 percent of the Earth's total surface area. The Atlantic Ocean, Indian Ocean, Arctic Ocean, other seas, they are also big but not as big as the Pacific. The planet's climate is largely modulated by temperature changes (warming-cooling cycles) in the Pacific Ocean. "Unprecedented warming" -- anyone, please say that again? If people believe that the planet is really in danger, they should turn off their lights many hours every night the whole year, not just 1 hour per year. 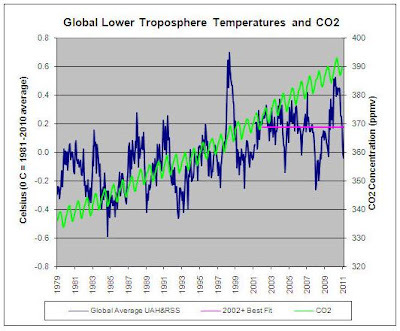 And here is a graph of air temperature (lower troposphere, about 8 kms above sea level) vs. carbon dioxide (CO2) concentration in the atmosphere. Air temperature data (blue line) are gathered by satellites and interpreted by the Univ. of Alabama in Huntsville (UAH) and the Remote Sensing System (RSS). So the blue line is the average of UAH and RSS data. CO2 concentration (green line) is measured at Mauna Loa, Hawaii. This graph is from the Friends of Science. Air temperature data from January 2002 up to February 2011 (red line, best fit) showed a 0.0 C temperature anomaly. Zero warming over the past 10 years after warming-cooling in those years have cancelled each other. Meanwhile, CO2 concentration keeps rising, persistently. "More CO2 emission causes more warming" -- anyone, please say that again? The EH is a big project to keep fooling hundreds of millions of people around the world. To keep climate alarmism high on their political agenda. There are tons and tons of money and political power involved in more environmental regulations, more energy taxation, more climate loans, more global climate meetings, more climate bureaucracies. Security of property rights is also security of individual freedom. Private property is private property. It can never be collective or government property. Otherwise, our car or cell phone is never our car or cell phone. Other guys can also say that it is also their own car or cell phone and they can get or confiscate such property from us. And we shall have zero peace and order in society. It is good therefore, that the Property Rights Alliance (PRA) in the US has consistently sponsored the International Property Rights Index (IPRI) annual reports. The overall IPRI score is derived from 3 main factors and their sub-factors, as indicated here. The sources of data were plenty and countries or economies are given a particular score depending on how respectful they are of each of the sub-factors given. Every year, the number of countries covered by the IPRI Reports keeps increasing. This is a result of more reliable and more comparable data getting more available. It is not healthy therefore, for an economy to embrace left-leaning policies that attempt to disrespect individual talents and performance, and forcibly collectivize things. Property rights is not a result of positive accidents that allowed the rights owner/s to own and control something without hard or meaningful work. Neither is it a privilege that was bestowed by the gods of the earth to their current right owners. Leftism cannot guarantee the respect and expansion of private property rights. 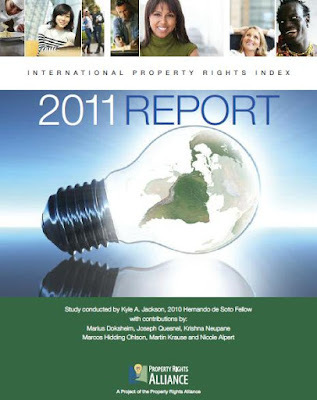 The IPRI 2010 Report was released in February last year. 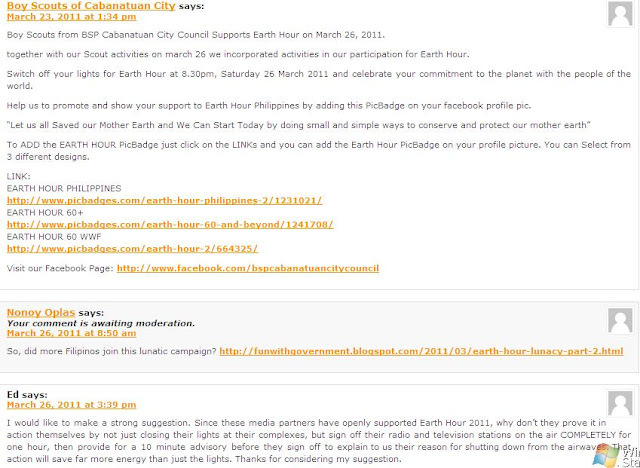 I wrote about it in Part 2 last February 27, 2010. 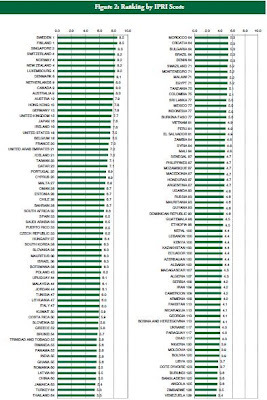 Out of the 125 countries covered in last year's report, the Philippines did not show any improvement in score, still the same at overall index of 4.5, making it rank no. 80 (80/125) and hence, still belonged to the 4th quintile. For sure, big corruption and plunder scandals in government, plus policy reversals last year like strong attempts to re-regulate the petroleum industry and actual drug price control, contributed to the low belief by entrepreneurs and the citizens of the government’s ability to really promulgate the rule of law. Populism and leftism, the synonym concepts of socialism, will push any country towards economic underdevelopment. Private property is not public or government property. Private enterprises’ pricing should not be tinkered as government pricing. 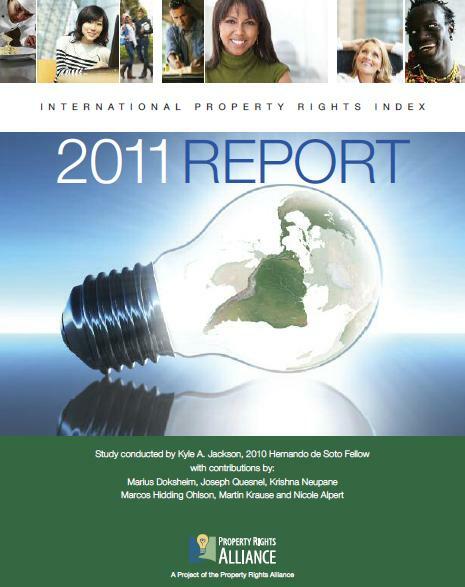 This year's IPRI 2011 Report was released last week. It was written by Kyle Jackson, a PhD Economics student at George Mason University (GMU). Kyle actually invited me to contribute a short discussion on property rights and the real property tax (RPT) imposed by local governments in the Philippines. It was a big mistake on my part that I did not send him a discussion paper about the subject. But nonetheless, I am happy that Kyle was able to pull a comprehensive research work in this year's Report. 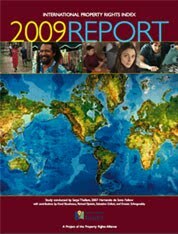 Four more countries were added to those covered in the 2010 Report, so that a total of 129 countries are covered this year. And once again, the strong link between economic development and property rights protection has been re-established. ... the protection of both physical and intellectual property is equally important in nature. 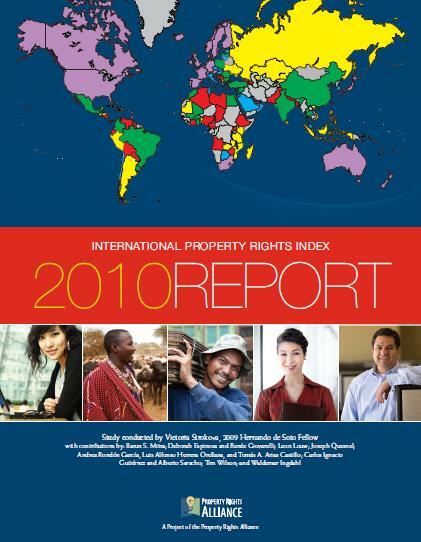 Individual freedom, economic expansion and job creation depend on securing property rights. Patents, trademarks and copyrights provide inventors and great thinkers with the ability to be rightly rewarded for their innovations. Likewise, land rights provide empowerment through ownership, allowing citizens to utilize and prosper from their investment. Economic growth only occurs when property, in all forms, is respected and protected. 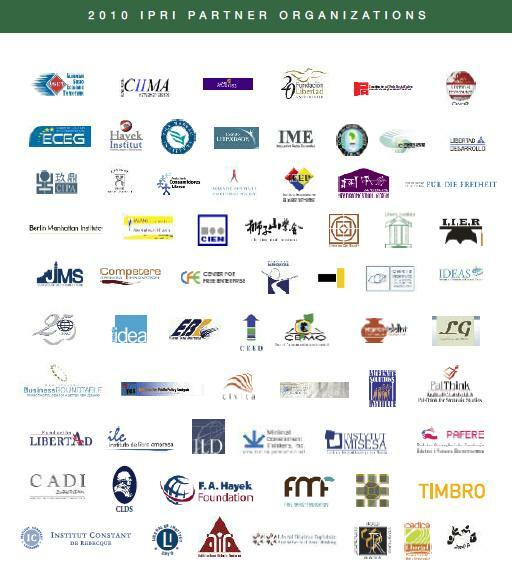 For the 3rd year in a row since the 2009 Report, our think tank, Minimal Government Thinkers has remained as one of the many free market think tanks from around the world that co-sponsored the publication and dissemination of the IPRI Report. We are also the only Philippine-based think tank among this prestigious list, about 67 independent think tanks from many countries. Ok, so how did the Philippines and other East and South Asian countries fared and ranked with the rest in protecting private property rights? 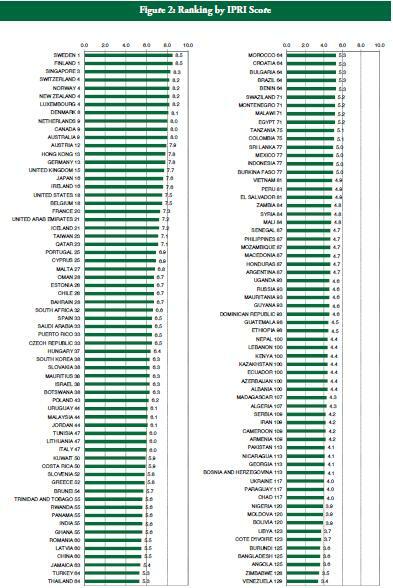 It is definitely disgusting to see your country slipping from an already low rank in last year's Report to an even lower rank in this year's Report. What happened? The Philippines (87/129, still in the 4th quintile) government -- then under former President Gloria Arroyo as the data used were for 2008-2010 to allow for global comparison across many countries -- has become more confiscatory? 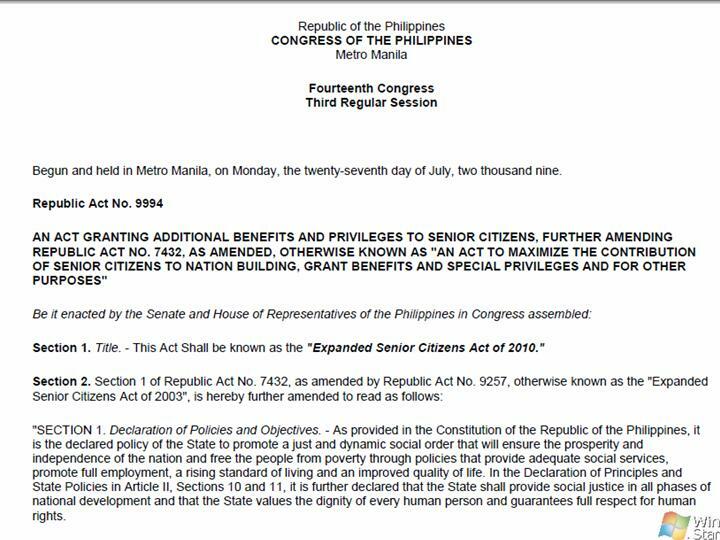 Or more private individuals, groups or corporations have become more confiscatory while the Philippine government was just watching? Or the other countries that ranked lower than the Philippines last year simply improved significantly this year, jumping us overhead while many Filipinos were busy with the elections and all the drama and political stunts associated with the elections? 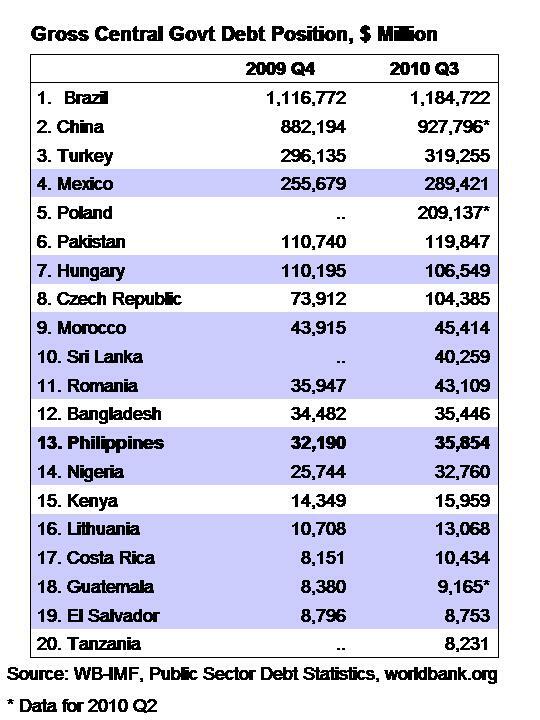 Whatever is the reason, unless we Filipinos will fully understand and respect private property rights, physical or intellectual property, more countries currently in the cellar will slowly overtake us in this important global ranking. Vietnam and Sri Lanka already overtook us. I've been blogging since late 2005 and prior to that, I've been engaged in some online debates via different yahoogroups since around 1998. The "itch" to write a book has been there since around 2007. Then last December, a friend, Rodolfo "Ozone" Azanza, who has written already two small books like This is Your Kung-Fu: Deliberate Mindsets for the Non-Hermits, introduced me to his publisher, Central Book Supply Inc. in Quezon City. I said that I want my first book in the first month of 2011. After communicating with the publisher, I sent the final draft to them by January 11, 2011 (1-11-11). In less than 2 weeks, the book was delivered to me. Yehey! 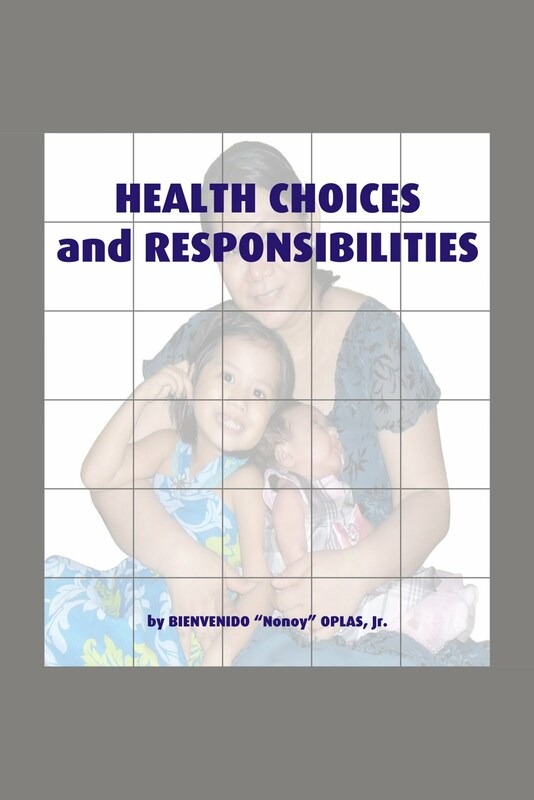 In the introduction of the book, I wrote this: Finally, I chose the title Health Choices and Responsibilities because of my two firm beliefs: One, people have control and choices in taking care of their body and mind, that there are plenty of individual choices to be healthy or be sickly, and there are many choices in financing healthcare. And two, healthcare is mainly a personal and parental responsibility, although a few health issues should fall under government responsibility. The girls on the cover? 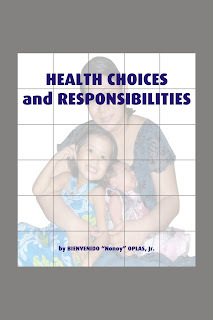 Well, they are my wife and my two young daughters :-) I chose them to be in the cover to emphasize my point above that in order to have a healthy population, parents (or guardians) should work hard -- zero complacency or alibi -- to have healthy kids. Parents should rely on themselves, their family members and friends, and not on the government, to ensure the good health and good future of their children, or their poorer relatives' children. 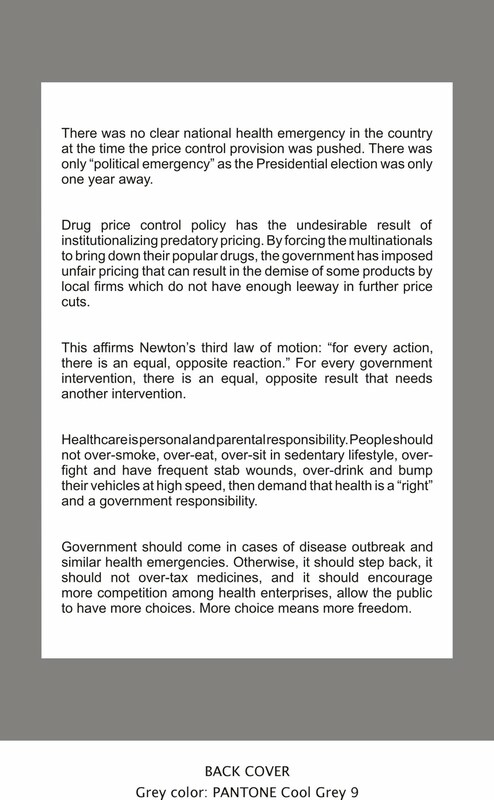 Here's a portion of the back cover: ...Drug price control policy has the undesirable result of institutionalizing predatory pricing. By forcing the multinationals to bring down their popular drugs, the government has imposed unfair pricing that can result in the demise of some products by local firms which do not have enough leeway in further price cuts. Government should come in cases of disease outbreak and similar health emergencies. Otherwise, it should step back, it should not over-tax medicines, and it should encourage more competition among health enterprises, allow the public to have more choices. More choice means more freedom. I have given away my book to a number of friends, especially to the godparents of my two kids :-), other friends in the free market movement. Like Barun Mitra (middle), founder and director of Liberty Institute in India, and Jules Maaten (beside me), resident manager of the Friedrich Naumann Foundation for LIBERTY (FNF). 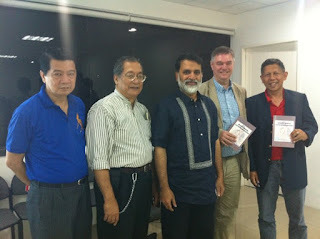 The others in the picture are friends from the UPSE Alumni Association, Sim Endaya and Gary Makasiar. I kept postponing the posting of this story about my book for several weeks now. I prefer to write other topics than about my book. 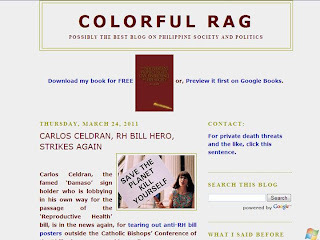 But then another free market friend, Paul of Colorful Rag blog, already wrote a review about my book yesterday, Review: "Health Choices and Responsibilities". Paul is a brutal, frank, and independent-minded free market intellectual. Though he has lots of praises about my book, he also has several punches of critique about it. Which I am really thankful. There is nothing, zero, in the free market literatures that free marketers should think the same all the time. On the contrary, the free market literature deeply relies on spontaneity and in the absence of central planning -- like what many governments, the UN, and foreign aid bodies do -- and absence of uniformity. Diversity and spontaneity. They are the hallmarks of the free market, individual liberty movement. Ohh, ok. Someone asked me, "Where can we buy your book if you don't give us a complimentary copy?" It's available at Central Books, they have online store and a few bookstores around the country. Their main office and bookstore is in 927 Quezon Avenue, Phoenix Building, Quezon City. The building is in front of Pegasus bar I think. Soon it will be available at www.divisoria.com too. And the UPSE cooperative store at UP School of Economics, Diliman, Quezon City, also sells it. * Update: I've uploaded the book in scribd.com here. Thanks. After posting WB corruption of civil society last week, two things happened. One is that a friend working in WB Manila explained to me the various anti-corruption measures and projects that the bank does and support which will ultimately, limit the expansion of government. And two, I have seen one WB-funded project to assess government procurement of health products, presented this morning. I was then convinced that somehow, the bank is trying to be serious in reducing corruption in government. It attempts to make government procurement of certain health and other social services as transparent as possible, via electronic posting of information. These include: products and services being procured, from whom, when, legitimacy of the supplier, legitimacy or registration of the product or service being purchased, how much per unit cost, how much total cost, other terms, and so on. 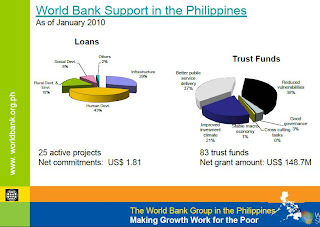 WB lending to the Philippines in social services is huge, around $1.8 B since 2007 alone. Click on this table to view a larger image. I constructed it from the original table in the WB site. The presentation this morning on corruption in one social service sector is still not available for public release. I don't have the soft copy yet but I can get it once it's been cleared for public release and discussion. When people see those data, I'm sure many of them will get angry at the new set of corruption in government. I was angry when I saw it. Will post those data later here, probably in more than a week. Writing and blogging on a free market, individual freedom, and less government perspective is still a scarce resource in this country. But nonetheless, there are a few Filipinos who have taken this path. 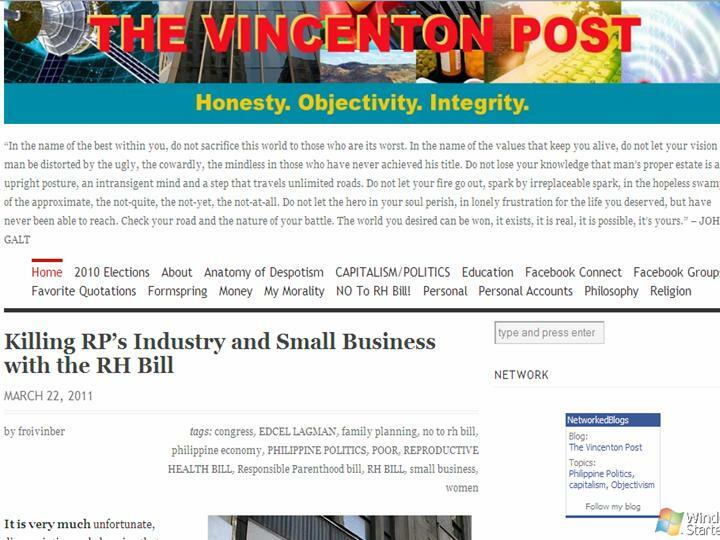 I visit those free market blogs by fellow Filipinos from time to time. Today, I am happy to see that 3 of them, including this blog, have global ranks of below 2 million (out of probably a billion blogs and websites worldwide) over the last 30 days. Here are their global ranks based on www.alexa.com ranking as of today. 1. This blog. Apologies if this would look like a self-serving promotion. But I just looked at the alexa ranking. Funwithgovernment.blogspot.com has a three-month global Alexa traffic rank of 2,236,614, and visitors to it spend approximately 82 seconds on each pageview and a total of 90 seconds on the site during each visit. Roughly 52% of visits to the site are referred by search engines, and about 88% of visits to Funwithgovernment.blogspot.com are bounces (one pageview only). We estimate that 48% of the site's visitors are in the US, where it has attained a traffic rank of 465,311. I like this blog because it is always packed with economic and finance data, and keeping the free market perspective always. The blog owner, Benson Te, is also a friend. Benson posts about 2 to 3 articles per day, I think. 3. The Vincenton Post. 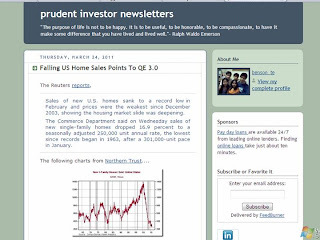 The owner of this blog is also a friend and a big fan of Ayn Rand and her Objectivism philosophy. I like this blog because of its consistent anti-statist perspective and advocacies. 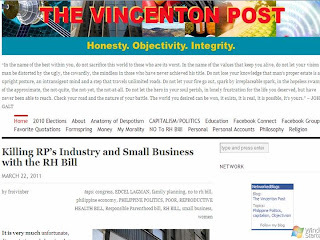 The author's favorite topics are education is not a right (it is parental responsibility and state universities should be privatized) and anti-state sponsored and taxpayers-funded Reproductive Health (RH) bill. 4. Colorful Rag. The blog owner, Paul, is another friend. Paul has written two books so far on political philosophy. I like this blog because of its good sense of humor, frank and straight arguments, and for consistently arguing the primacy of individual liberty, the rule of law and property rights. Lately, Paul added really funny pictures and cartoons, and some gory pictures of gory politicians and individuals. 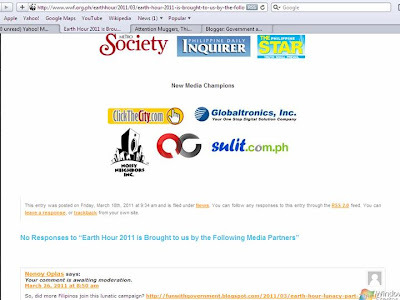 There are other Filipino free market blogs which do not have global rank on alexa.com yet. Here they are, in alphabetical order. Waging a war is not only to protect existing interests, like the lives of ordinary civilians being massacred by threatened dictators and monarchs, oil and business interests in a country undergoing bloody civil war, etc. Waging a war is also to protect or secure future interests, like whoever helped the new victors (and current rebels) will get special business deals and huge contracts at large scale economic reconstruction in the future. 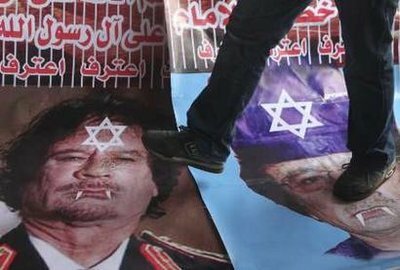 This scenario is slowly shaping up among a number of leaders of European countries who have sent their fighter jets, battle ships and submarines to Libya to bomb certain military targets of the 42-years in power Libyan dictator Muammar Gadhafi. That's how one report from The Globe and Mail, Libya's economic war rages in southern Europe has painted. "Why does Italy cherish a NATO takeover? Because the Italians do not want the Libyan rebels seeing the air war as largely an Anglo-French effort. 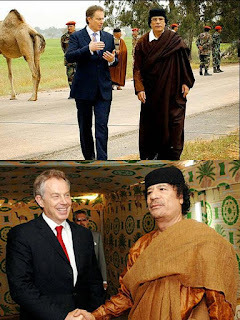 Italy fears that, should the rebels succeed in overthrowing Moammar Gadhafi’s regime, they will repay the British and the French by giving them the most valued reconstruction and oil projects. If NATO takes control, Britain and France’s influence over rebel loyalties would be diluted, putting Italy on a more equal footing for the post-war reconstruction spoils, whenever that may come. "France has been resisting transferring military control to NATO. On Wednesday, however, France softened its position. 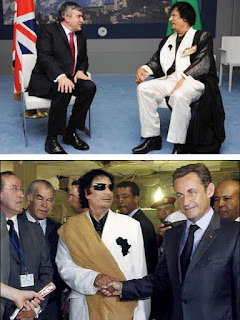 It appears NATO will take over..."
"Italy, which ruled Libya as a colony for 30 years, until the Second World War, is especially worried about France muscling into the Libyan economy. Italy considers Libya part of its economic landscape. Eni, the Italian national oil company, and Europe’s fourth largest oil player, is the biggest investor in Libya. Before the war started, Eni was pumping about 250,000 barrels a day of Libyan oil, most of which went to Europe. Last year, according to Morgan Stanley research, 32 per cent of Libyan oil exports went to Italy (France, Germany and Spain were the other largest importers). "But French oil giant Total is also on the ground in Libya; it pumped about 50,000 barrels a day until the war virtually eliminated exports. 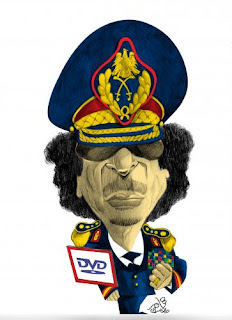 Italy would go into a rage if the rebel forces, should they overthrow Ghadafi, were to reward Total with lavish oil concessions and investment opportunities in other projects, like highway construction, that the Italians consider their right." 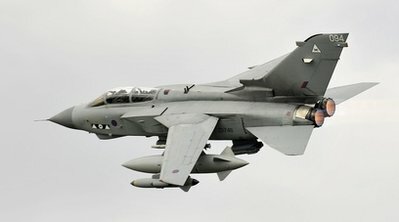 As the bombings continue in Libya, I was also thinking that when most of Gadhafi's radars, fighter jets and choppers, bombs and tanks have been charred, and Gadhafi himself is thrown out of power, the next administration will also buy new radars, new fighter jets and choppers, new bombs and tanks, from the same countries who crippled and destroyed these military hardwares of Libya. Paying those new military spending will not be a problem for Libya or other oil-exporting countries that currently undergo political turmoil. They will not need foreign aid and loans from the west, they have lots of oil to sell. Since the current rebels are fighting for political democratization and not individual liberty, should they win someday, the profligate lifestyle of having modern army, air force and navy will most likely be continued, if not expanded. There is something that projects a "macho" image for leaders of countries to have those lethal machines and bombs to display during their "national day" or "independence day" or similar events. Whether these countries are under dictatorship, absolute monarchy, or democracy. Huge military spending are wasteful and a display of non-productive use of the citizens' money or a country's natural resources. Business cronyism is also a display of wasteful and inefficient economic policy. Somehow there is synergy between the BIG governments of Europe and North America on one hand, and the BIG governments of Africa-Middle East Asia on the other hand. Before, during and after the on-going political turmoils there. After posting yesterday Part 6, Poor countries' debts, it attracted several comments from some friends, especially in related to the Philippine government's public debt. Hence, this follow up data and article. I got this from the DOF's Bureau of Treasury website. 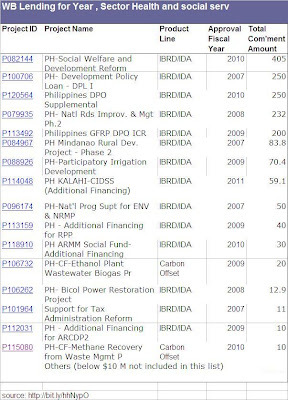 This table just shows how irresponsible ALL Philippine governments have been -- by living beyond their means, by not controlling their spending even if revenues are not sufficient, so they went on endless borrowings, and the debt keep rising and rising. 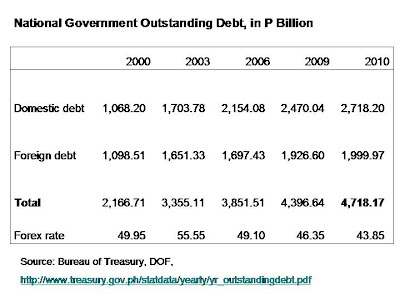 The end-2010 public debt of P4.718 trillion pesos, total for both domestic and foreign debt, if converted to US$ at end-2010 exchange rate of P43.85/$ was equivalent to $107.6 billion! So what does it imply: (a) we are a poor country because of the high government debt, (b) we are a poor country but has a rich government, (c) we are a rich country impoverished by our government, (d) all of the above, (e) none of the above? But some BIG government apologists can quickly say, "The debt is high but the GDP is also high. So the debt/GDP ratio has not increased through the years. It is alright to have a high public debt so long as the economy is growing. We can even argue that the economy is growing because of high government presence and intervention in the economy." Wrong. An ordinary household would normally live within their means. If the income is small, then they don't buy a car or live in an expensive house. When the income expands, then they also expand their spending, and society develops as people work more, save more, and invest more. Governments are doing the opposite. They promise a lot, spend a lot (it's not the politicians' own money anyway) then borrow a lot. And the debt becomes bigger and bigger, and the proportion of taxes and fees collected that go to debt payment, interest + principal, gets bigger. "Drop the debt" campaign by rock star Bono and other activist groups like the Freedom from Debt Coalition (FDC) is wrong. Drop the borrowings first, then drop debt payment later. Before we can have freedom from debt, we should have freedom from endless-borrowings mentality. Foreign aid agencies like the World Bank (WB), Asian Development Bank (ADB), International Monetary Fund (IMF), various UN bodies, USAID, etc. have funding for civil society groups and NGOs to get their support for "good governance" projects and programs. There is implicit message that such civil society groups should not question the bloated and BIG governments, and the big taxes and fees that support those big governments and big foreign aid bodies. Below is a WB Civil Society Fund (CSF) funding opportunity. The WB wants civil society groups to be engaged in good governance projects, which is a good program. But as I mentioned above, the WB would also not be happy if civil society groups will demand less government, less regulations and less taxation. The business of the WB and other foreign aid bodies is to help expand governments of developing economies for all sorts of reasons and alibi -- save the planet, save the turtles and other wildlife, save the poor, achieve the MDGs, save the world economy, etc. Minimal Government Thinkers and real free market groups cannot and should not apply for this kind of funding. Why? Well, we can not attack the WB and other foreign aid bodies whenever they are in the "Rah-rah-rah, more taxes" or "more climate loans racket" mood if we get money from them. Seriously, I think these foreign aid bodies are abolishable. But of course, only a few, if any, civil society group in this country share our ideas and philosophies. The Civil Society Fund or CSF (formerly Small Grants Program) supports activities related to civic engagement by providing small grants administered through World Bank Country Offices. from the CSF within a five-year period). What Size of Grants are Awarded? 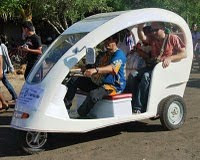 On ADB climate loans racket for electric tricycles. These tricycles look cute, but should government enter this foray and resort to additional ADB borrowing, when private sector operators can do that function and not compromise further our public debt situation? 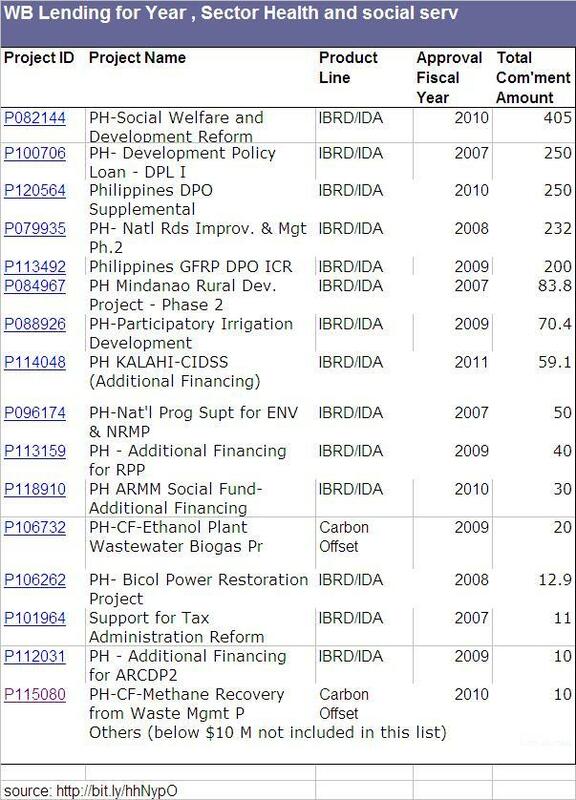 ADB is more than happy to make such loans as it will make lots of interest earnings from those climate loans racket. The probability that the ADB and other foreign aid bodies will go bankrupt is zero. Even if they will give in to Heherson Alvarez's propoposal that the Philippines should borrow $10 B for 10 years, or $100 billion of climate loans robbery. Government does not live on voluntary exchange, like what we do in our private enterprises. You dissatisfy your clients, they turn their backs, they tell their pals how lousy you are, later you close shop and might go hungry. Government lives on forced exchange and coercion. Even if you do not support those electric tricycles, even if you do not support those climate adaptation measures to "save the planet", you pay taxes, by hook or by crook, and government will pay the WB, ADB and other debt pushers. Debt pushers are no different from drug pushers. They push for addiction and endless dependence. So far I have written only the debts of rich countries in this "Fiscal irresponsibility" series. I am lucky to see the IMF-WB data today on public sector debt statistics. Data there refer only to several poor or emerging economies. Thirty two (32) countries were covered in that list, I took only the top 20 big debtor poorer countries. The numbers below refer only to external debt by the central or national governments of these countries. Excluded here are debts by the monetary authorities, banks, and so on. Brazil and China are notoriously indebted, both have combined public debts of around $2 trillion as of 3rd quarter of 2010. Eight countries have debts of more than $100 billion as of last year. 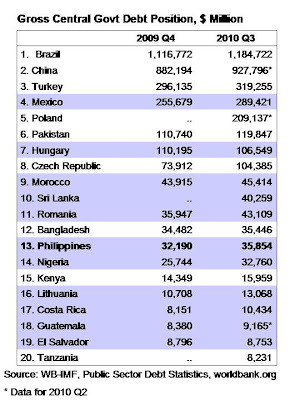 The Philippines is at par with Bangladesh in size of debt. 2007 28.43; and 2008 29.63. 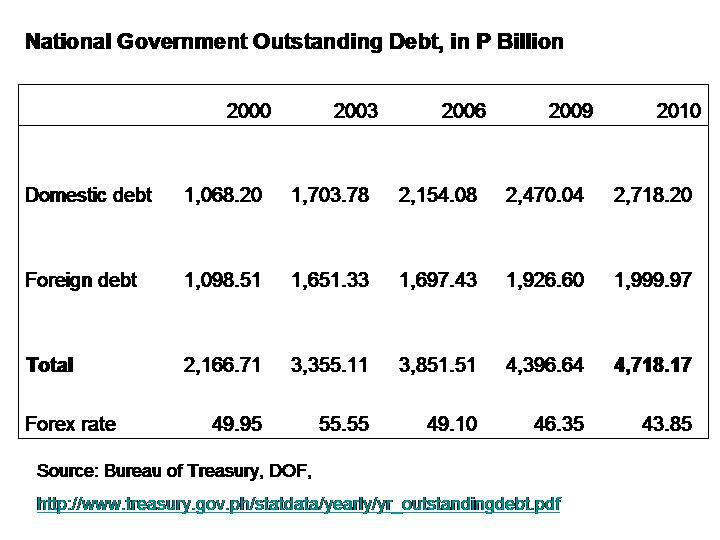 See BSP data on External Debt. The purpose of governments' external borrowing is to augment local resources (taxes and fees collected, local borrowings) for whatever development programs they have. If those programs were productive and not just wasted or stolen, their economies' productivity should have increased, they can pay the past debts and they need not borrow more and more. This is not happening in many countries, rich and poor alike. The debts keep rising. External borrowings only created a huge army of debt-happy and dependent politicians and bureaucrats in debtor countries, and an equivalent army of debt-pusher bureaucrats in foreign aid institutions and banks. Fiscal irresponsibility, of living beyond their means year in and year out, is one hallmark of most governments, the BIG ones especially. I am also ready for any debate on climate science and policy should you wish to organize one. As I expected, zero reply from them. I assume they are super-busy telling people to switch off their lights this coming Saturday night so that they can help "save the planet." But for me, absence of reply for serious critic of their major programs is lousy. And would signal cowardice to debates. ... I also gave a talk last November 2009 at the Rotary Club of Makati Dasmarinas, and the organizers asked me to be a reactor to the head of WWF, Mr. Lory Tan, who will be their speaker the next week. I said "go-go-go." But a few days before his talk, I was advised not to come because it might cause "divisiveness" in the club. I think it was a diplomatic way of saying that Mr. Tan does not want a debate, Like Al Gore, like IPCC head Pachauri, like Leonardo di Caprio, etc. The Philippine government's weather bureau, PAGASA, advised that This time, expect a cooler summer. "Robert Sawi, PAGASA chief forecaster, Sunday said he expected the summer months this year to be “cooler” than last year due to the La Niña weather phenomenon." And here is the El Nino Modoki Index (EMI), 2010-11 upper graph, 1981-2011 lower graph. 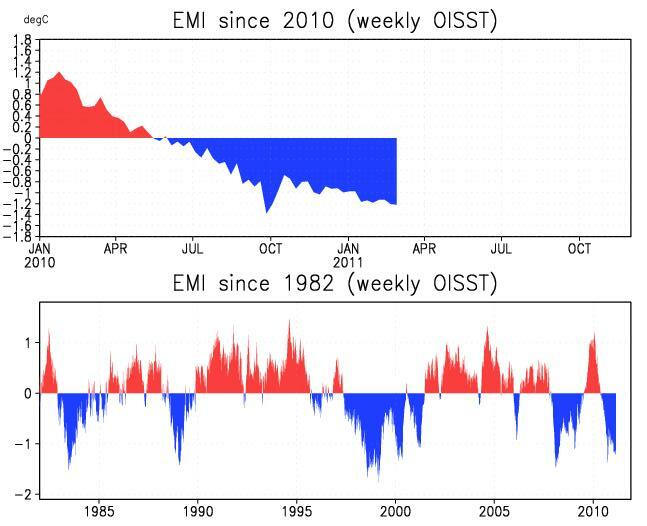 Red represents warm, El Nino period, blue are cold, La Nina period, in the equatorial Pacific Ocean. Data is from WUWT's ENSO page. For the global lower tropospheric temperature update and graph, check my earlier paper, Warming absent, politics present more than two weeks ago. Is the current La Nina ending soon, and the world will resume its "unequivocal warming" trend, of more drought, less rain, less snow, less typhoons, and more melting of polar ice, more increase in sea level height? Based on the latest ensemble forecast for Nino 3.4 region, the answer is NO. While La Nina is projected to end around June this year, the rise will be a weak one, up to about +0.3 C until the end of the year, versus the -1.5 C temperature anomaly the past few months. Data is from the same WUWT ENSO page above. Now here's another measurement and projections for the current La Nina, from the Earth System Research Laboratory (ESRL) of NOAA. The answer to the above question is a more definite NO. 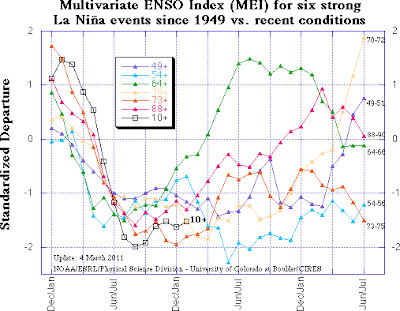 The graph shows the Multivariate Enso Index (MEI). NOAA projects a "well above 50%" chance that La Nina will continue until next year. 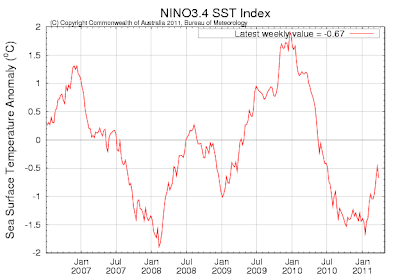 The black line represents the current La Nina, and it's still in the -1.5 C colder than normal. The NOAA paper noted that "During the next few months, the MEI may very well stay stronger than Niño 3.4 since the latter is not normalized to account for weaker variability during this time of year." 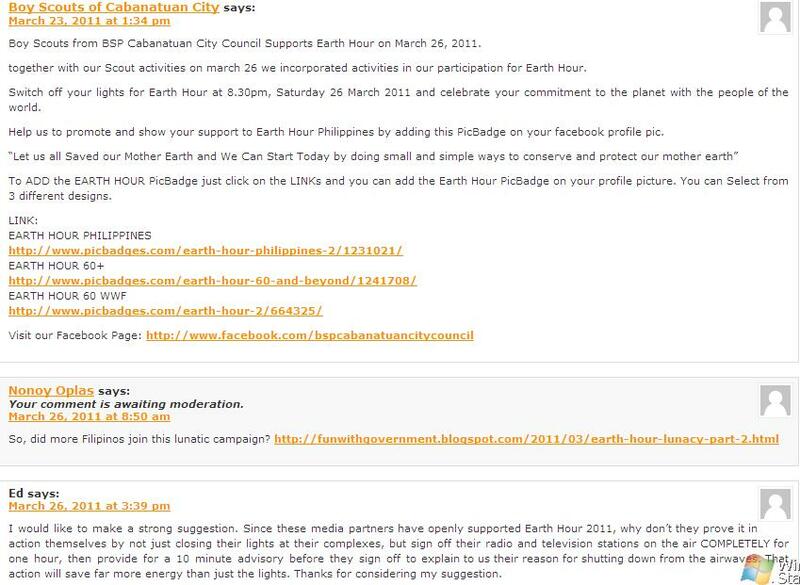 So this coming Saturday, another lunatic campaign called "Earth Hour to save the planet" will be staged to keep scaring and fooling the public of a "catastrophic anthropogenic global warming" (CAGW) and its cousin, "man-made climate change." The above EMI graph shows that the Earth's climate is in a pure, simple, natural cycle of warming-cooling-warming-cooling. But some nuts keep telling us that there was only "unprecedented warming" in the past and "unequivocal warming" into the future. Keep scaring and fooling the public so they get lots of donations and funding. Yeah, right. Politicians tend to be as populist as possible just to get votes again and again. The usual practice is to create various welfare and subsidy programs to be funded either by existing taxes or new borrowings and hence, future high taxes. But there is another way by which politicians can achieve their goal without directly compromising taxpayers’ pockets. And that is by forcing private companies to provide mandatory discounts or forcible price cuts. And whatever revenue reductions if not losses, are not necessarily deductible as tax credits. 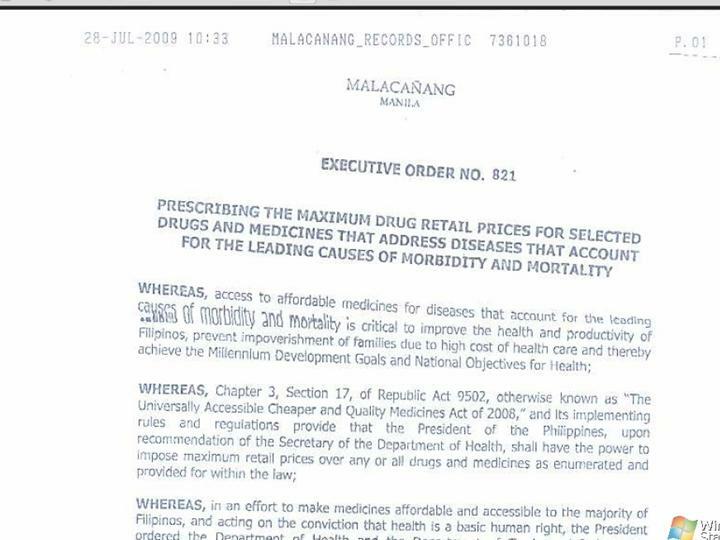 In the case of drugs and medicines, there are currently two types of mandatory price cuts or what I call as “double price control.” The first price control is the mandatory 20 percent discount on drugs (and food in restaurants, fares in planes, buses, etc.) 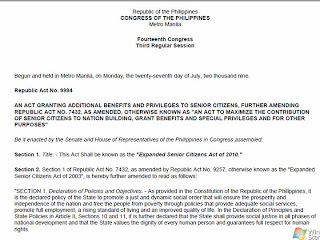 purchased by senior citizens (SCs), with another follow up law of mandatory 20 percent for persons with disabilities or PWDs. The second price control is the mandatory 50 percent price cut for selected medicines (all are products by the multinationals, not a single drug produced by local pharma). This was implemented since mid-August 2009. The latter is “easier” to implement because the price cut is limited to a few identified drugs and it applies to all consumers, young and old, who buy those medicines. 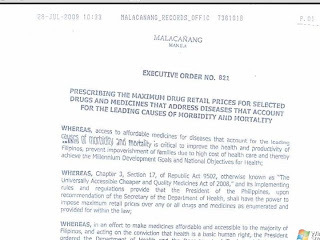 No ID or physician prescription and other papers will be sought by the drugstores. 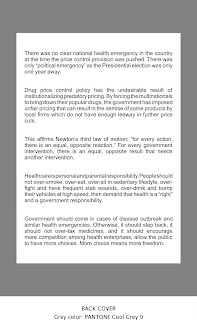 The prices of drugs covered by the list are simply slashed by 50 percent of their previous prices, no questions asked. The former, the mandatory price cut of 20 percent for drugs purchased by SCs, is a lot more complicated and harder to implement. To avail of rebates from the drug manufacturers and the BIR (for the VAT deductions), drugstores need to present these data about each and every single SC who buys from them: SC full name, age, address, SC ID number, drugs purchased record, physician prescription, drugs purchased at the store, how much, etc. Only a few of the small drugstores have copying machines to photocopy those information. If they buy that machine, that will be another operating cost, plus their maintenance and electricity consumption, even if the drugstores are losing money from those mandatory discounts. One negative effect of this revenue loss and complex compliance procedures, is that many small drugstores have stopped selling the drugs that many SCs purchase more often. And this adversely affects access. Even if the drugs for the SCs have been slashed (20% + 50%) but if they are not available, then the social goal of having “affordable, available drugs” is immediately not met and defeated. The complex compliance procedures in implementing the mandatory price discounts for SCs is among the topics that were discussed during the meeting of the DOH Advisory Council on Healthcare early this week. I am a member of this Council since 2009. It used to be the Advisory Council on Price Regulation. After the price control has been implemented and pharma players, both multinationals and locals, have learned to live with the policy as there are no signals from the government to pull out the policy, the Council has been converted and renamed as Advisory Council on Healthcare. The focus of the meetings is how to attain “universal health care” or UHC for many Filipinos. 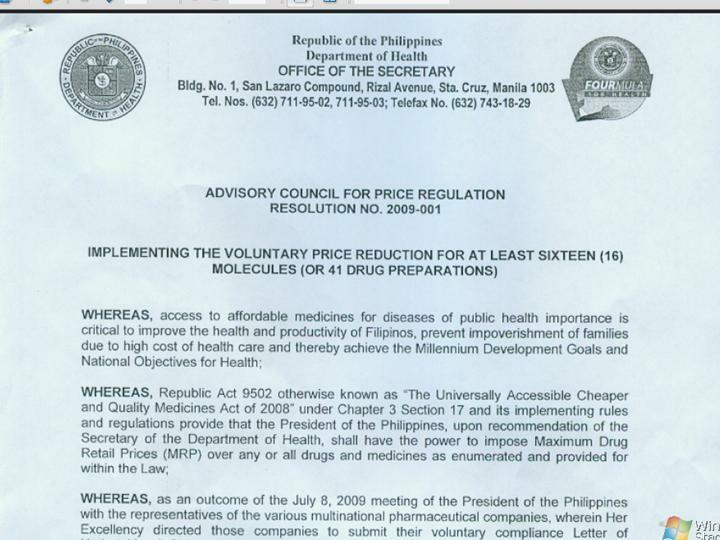 In another topic of the meeting, on monitoring the implementation of the mandatory 50 percent discount for selected drugs, I spoke to question the continued use of Government Mediated Access Price (GMAP) and Maximum Drug Retail Price (MDRP) because these terms and concepts are not found in the law (RA 9502) and its implementing rules and regulations (IRR). Thus, I consider these terms as technically illegal. 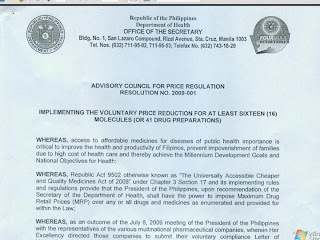 GMAP simply means Gloria Macapagal Arroyo Price when Gloria was still the President of the country at the time the 2nd drug price control policy was imposed in mid-August 2009. It was coined by the DTI and DOH leadership at that time. The official term in the law and its IRR is Maximum Retail Price or MRP, not MDRP. But the Gloria boys then did not want to associate the policy to former Sen. Mar Roxas, who was then the Chairman of the Senate Oversight Committee on the implementation of RA 9502, the Presidential Candidate of the Liberal Party, and a constant critique of Gloria. So the Gloria boys did not want MRP to mean “Mar Roxas for President”, so they inserted “drug” to make it MDRP. I added that these two terms, GMAP and MDRP, are not only technically illegal, but their continued use until today speaks of the heavily politicized nature of drug pricing in the country. Even if the politicians who orchestrated their acronyms and political connotations are no longer in power. Thus, I suggested that the DOH and other players should stop using those GMAP and MDRP. Use instead the one that is officially in the law, which is MRP. I was glad that the other members of the Council did not object to my proposal, including the top DOH officials in the room. Healthcare policies by the government are already political by nature. It is something that even free marketers like me already recognize. We only request that the extent of politicization be kept to the minimum. Where there is less government intervention in pricing and supply of health services, there is more leeway for the various players in the health sector – pharma manufacturers, drugstores, hospitals, physicians, pharmacists and other health professionals – to adjust to the various characteristics of the patients and the public. After 42 years in power, the Libyan dictator needs a make up to make himself a bit younger- and newer-looking. The guys who made this photoshop magic or related software are cute and funny, hahaha. 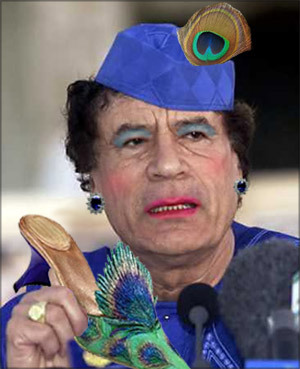 Hey, the UN just voted yesterday to impose the "No fly zone" order on Gadhafi's planes and choppers. After pounding and killing his people, he needed an about-face to say that he didn't do it, that he respects human rights. 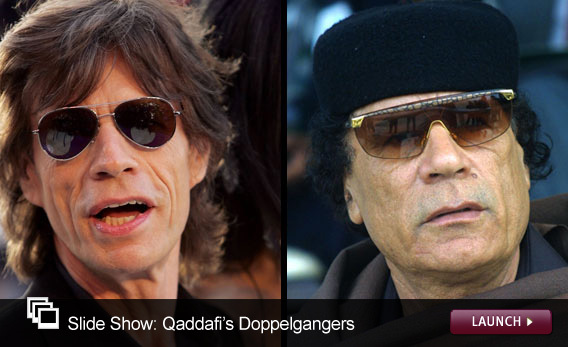 Were Gaddafi and Mick Jagger (lead singer, The Rolling Stones) siblings who were separated when they were young? The former is a rock star, the latter is a fashion star. 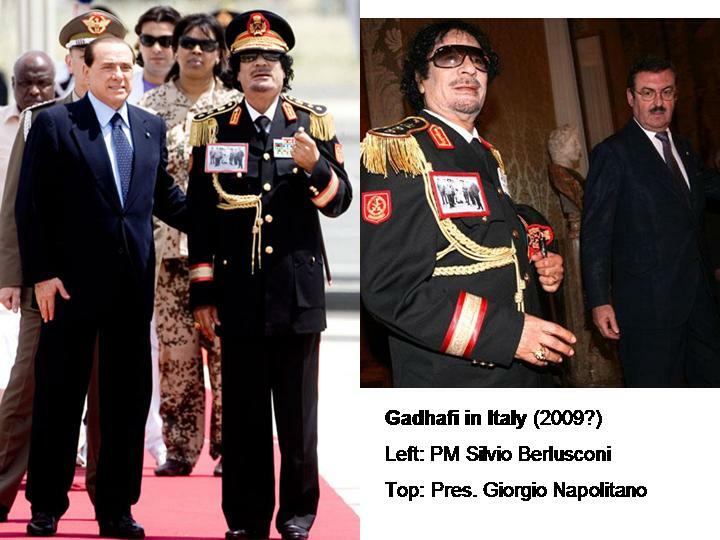 See earlier Weekend fun here, Gadhafi fashion. Mick Jagger sang, "I see a red door and I want it painted black, No colors anymore I want them turn to black..."
Gadhafi sings, "I see big oil and I wanted your green bucks, No protest no rallies I'll shoot and beat them black..."
Rock star Gadhafi, yeah! 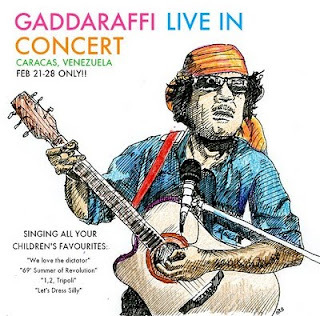 Here preparing for his rock concert with fellow dictator, Venezuela's Hugo Chavez. Here he looks like Santana. And Santana and Rob Thomas sang, "I could change my life to better suit your mood, Cause you're so smooth..."
And Gaddafi sing, "I could change your life to better suit my mood, Cause I'm so smooth..." Yeah! 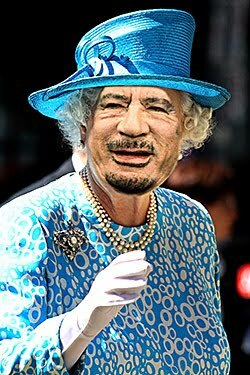 And Hugo Chavez can also sing, "I could change your car to better suit my oil, Cause oil is so smooth..."
Uhhrrrmm, Queen Gaddafi at Tripoliham (well, Tripoli + Buckingham, hehehe) Palace. Another brilliant product of photoshop + artist's talent. UK's Queen dresses beautifully and elegantly, with class. 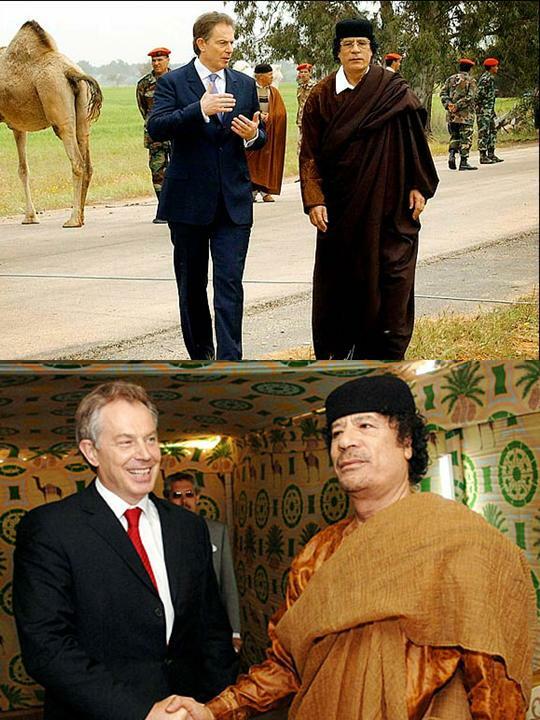 Libya's Gaddhafi dresses oddly and eccentrically, with some class too. The man though does not seem to like jewelries. But sometimes he dresses like a multi-bemedalled warrior and military commander in the warfront. Like this -- military dress paraphernalia, rock star long hair, Gucci sunglass, cool. Ahh, ok, he looks like the character of U2's "Sunday bloody sunday" song here: "And today the millions cry, We eat and drink while tomorrow they die..."
Well, it isn't tomorrow. It was yesterday and the last few days and weeks, he ate and drank and his people who no longer support him, they died. The Dracula is here. He thirsts for more oil and more blood, more money and more blood, more power and more blood. And another U2 song: "This guy comes up to me, His face red like a rose on a thorn bush, Like all the colors of a royal flush..." (Bullet the blue sky). 42 years in power and still not enough. More power, more blood, yeah! Electricity gives us extra freedom. We can work and have meetings further, or play with our kids, or party with friends, or watch tv/movies/sports competition even until evening. We can build, work and live in high rise buildings and go up and down anytime, 24/7, thereby saving space for roads, playground, farms, urban forest, and so on. Now there are many groups and people who have demonized our high use of energy and electricity. A few of them have attained high profile global status to peddle their lunatic view that "more electricity = more global warming and climate change." Thus, to reduce the evils of "man-made warming", we should cut our electricity usage. How? Via high energy taxes, high energy prices by forcing us to buy expensive and immature renewable power sources, high environmental regulatory fees. Some groups go beyond that. 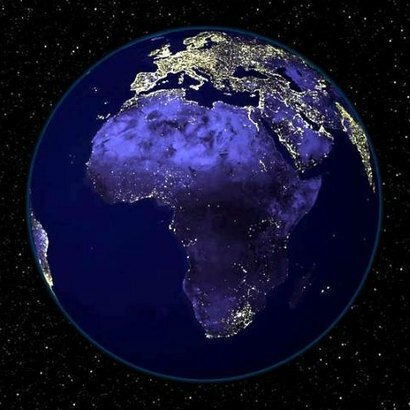 After successfully lobbying and supporting many governments on those rent-seeking behaviors above, they go extra by telling us that we should shut down our lights for one hour then reflect, feel guilty how we have "damaged and ruined our planet." 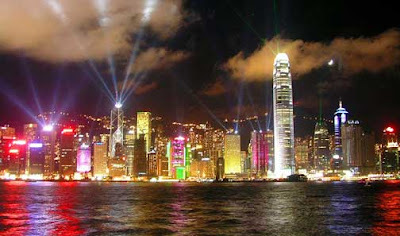 Thus, the annual "Earth Hour" campaign by the World Wildlife Fund (WWF). These guys are saying that we should use less electricity as much as possible. Perhaps like many countries in Africa. See this satellite picture at night, Africa in the south and Middle East Asia and Europe in the north. The head of WWF Philippines Climate Unit, Atty. Gia Ibay, put it explicitly: "...the true spirit of the event into our lives – which is to reduce our consumption of power, water and other critical resources." 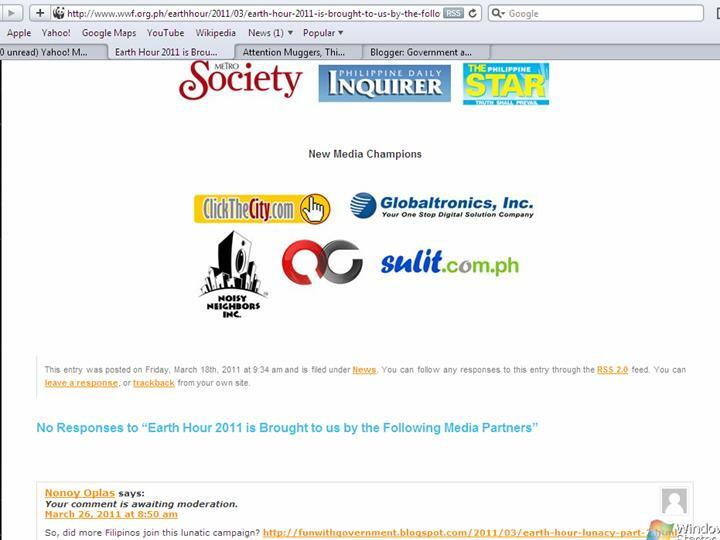 See Earth Hour 2011. 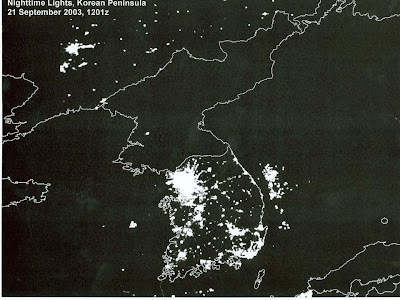 Aside from continental Africa, here's another good model for the WWF and other climate alarmists -- North Korea. 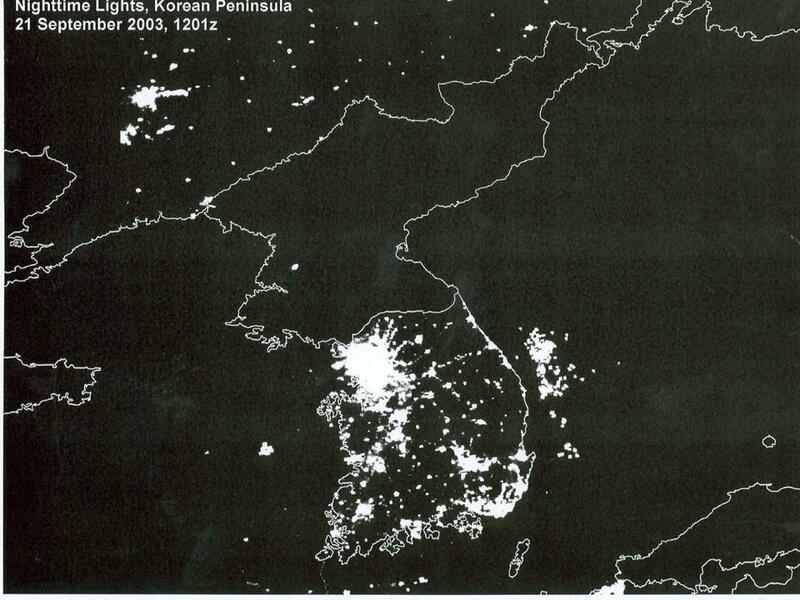 In this satellite picture taken in 2003, South Korea is the one with lots of lights, Seoul being the brightest. I am also reposting below a good article by Dr. McKitrrick from his blog. A very bad combination of people having no house and car and then heavy snow starts falling. 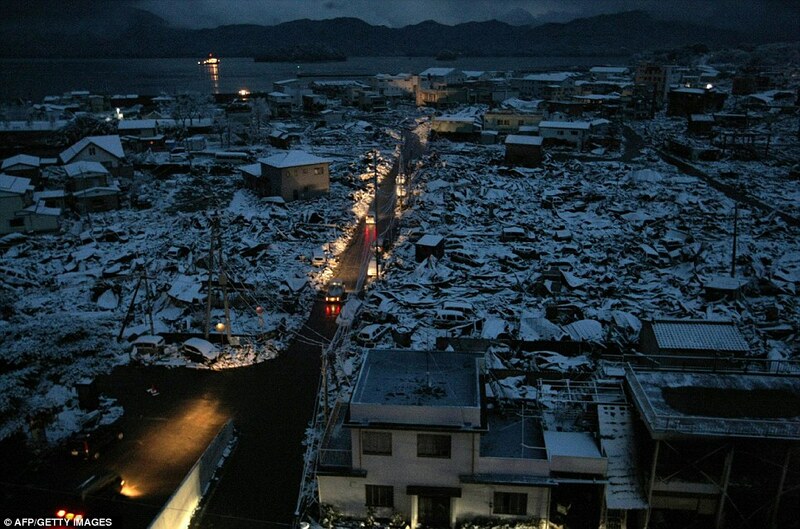 That's what thousands of survivors in the Northern Japan earthquake + tsunami last week endured early this week. 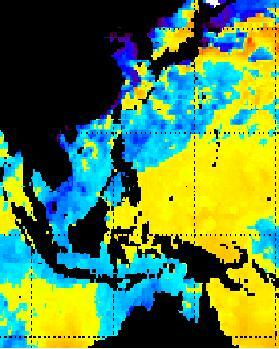 Here's the global sea surface temperature (SST) anomaly as of 14 March 2011. Note the sea ice (white) and colder than normal (blue) sea water to the north-east of Japan. It is indeed a bad period, last week and this week weatherwise, in that part of Japan. 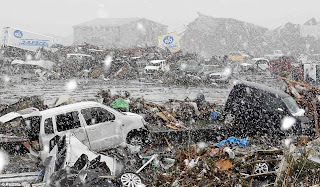 Below are two among many news reports on snow + post-earthquake Japan. All pictures here except weather images, are from Mail Online. 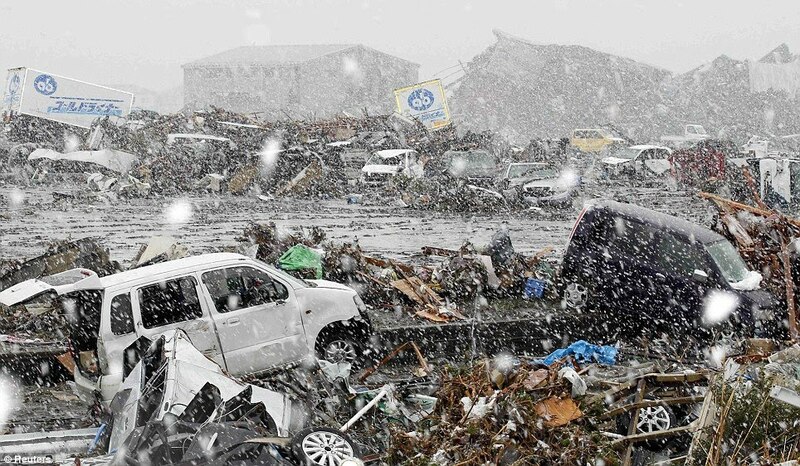 Freezing winds, hail storms and thick snow are the latest threats to 430,000 beleaguered survivors of northern Japan's week-long cascade of disasters. 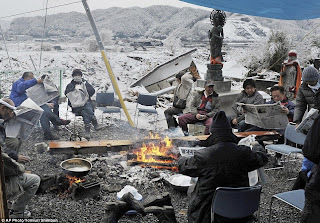 After a massive earthquake, devastating tsunami and nuclear crisis, many people made homeless are now facing icy weather, with temperatures forecast to plunge to –5C (23F). The soldiers here are stepping on snow-mud-debris surface. A bad combination to look for survivors, if any. 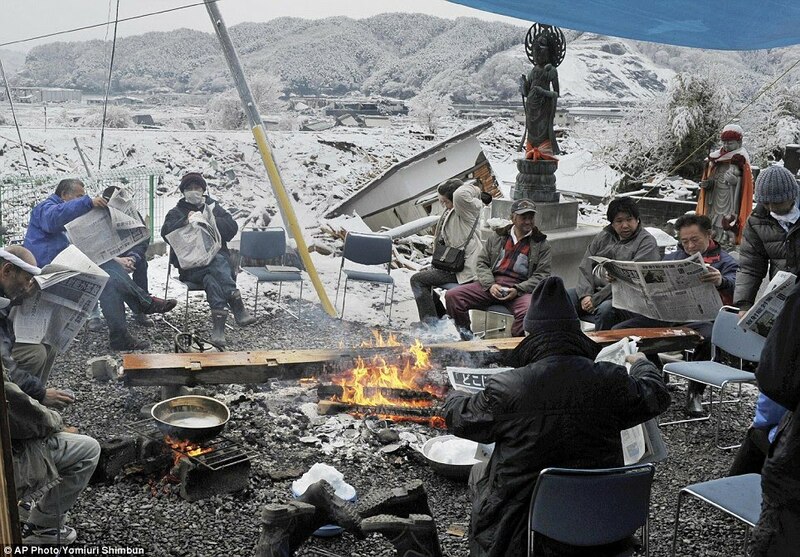 Survivors of EQ + tsunami are huddled around flaming firewood, suddenly a plentiful raw material. And how's the projected weather in the next few days, will the people there expect some warm and sunny days? Unfortunately, the answer is NO. 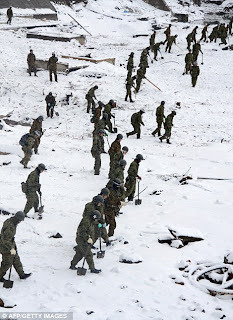 Japan and the rest of NE Asia will be in deep freeze. Projections of temperature anomaly (deviation from average) from 16 to 24 March 2011. 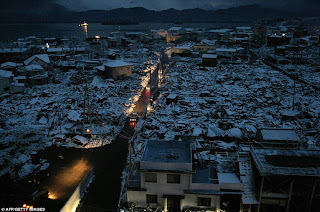 I hope that morons will stay out and refrain from saying that "global warming caused the earthquake and snow in Japan." Pol. Ideology 19: What is the Role of Government?